When Mary Clinton, 25, joined other activists to help organise the Occupy Wall Street movement on Sep. 17, she never imagined the gamble would turn into a 'populous left movement of the 21st century'. 'What makes this movement revolutionary is that there are new organisational forms taking place that haven't been tried yet and it's truly a new moment,' said Clinton, at the 'Young Workers & Organizers: Confronting a Failed Economy' forum held at the Murphy Institute for Worker Education and Labor Studies in New York on Saturday. The activist, who played a vital role in leading a push for the American Federation of Labour and Congress of Industrial Organizations (AFL-CIO) to jump on board and support the movement in September, spoke at the forum to encourage students, academics and organisers to help develop strategy for the next stage of the movement that could help recreate the economy and improve the lives of others. But Clinton was quick to clarify that this movement is not some new trend that has emerged over the last 60 days, but rather has been a decades-long struggle. Fellow speaker Alvin Ramnarain, field director and RWDSU Local 1102 union member, agreed that the Occupy Wall Street movement was not new but the tactics and the way things were happening so quickly was. 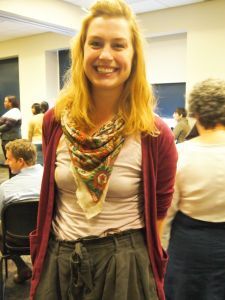 Julia Getzel, a journey-level carpenter and a member of the United Brotherhood of Carpenters from New York, had planned to take part in the Sep. 17 action that became Occupy Wall Street. But she had to pull out a few weeks before when she was offered a job that she couldn't turn down because she had been unemployed for 18 months. Getzel attended the forum and said she believed that the current disparity of wealth in the United States is more extreme than it's been in a century. 'I think what the Occupy Wall Street movement is doing is an amalgamation of what has been most successful in the past and chooses what works for today's hurdles,' Getzel told IPS. 'There's a huge amount of wealth (inequality) and it was an oligarchy like it is now. The difference now is that we have new technology to spread the message and we are going after the root of the problem and not as much as the single manifestation of a problem,' she said. One of the questions raised by the students and union members at the forum revolved around the credibility of a leaderless movement. They wondered what a leaderless movement looked like, how could things be accomplished with no set goals, and what direction would it take? One student said he had a fear of the whole concept because he didn't buy that 'labelling something leaderless made it leaderless'. 'I think it has to be leaderless in the sense that it's still in its infancy and has only been around for six weeks,' said Getzel, who has since been down to the New York movement site with fellow union members. 'If there was a leader for the movement, that person would have their own viewpoint and wouldn't be representing the 99 percent,' she told IPS. 'Leadership hasn't worked in the past 30 years for other paradigms with many unions weakening, so obviously there is something wrong with that model. Getzel said the wide spectrum of sectors involved - from hospital workers to office staff — each with their own particular concerns, meant it could be a challenge to develop a common outcome. 'Right now we're in the brainstorming stage and the actions they're doing concern disparities of wealth,' she said. David Pedulla, 29, a PhD candidate in sociology and social policy at Princeton University, was one of the speakers at the forum. He told IPS that one of the most pressing issues facing young people today was economic security in the form of unemployment and underemployment, as well as increasing debt burdens. Getzel said by uniting young workers, the union movement could be revitalised and made more representative of the rank and file. 'The movement can be a catalyst to renew and validate the energy that it takes to strengthen our unions to be reflective of the needs and rights of the rank and file worker and survive for future generations of the workforce,' she told IPS. Frances Fox Piven, a speaker at the forum and a political science and sociology professor from CUNY, said Occupy Wall Street was very aware of its linkages with other ongoing struggles and she believed it was the first youth movement in her lifetime that had reached out to the labour movement.